Wherever you sit, whichever way you turn your head, your eyes are likely to land on something furry, feathery, funny or otherwise sketchable at Drunky’s Two Shoe BBQ in Fremont. 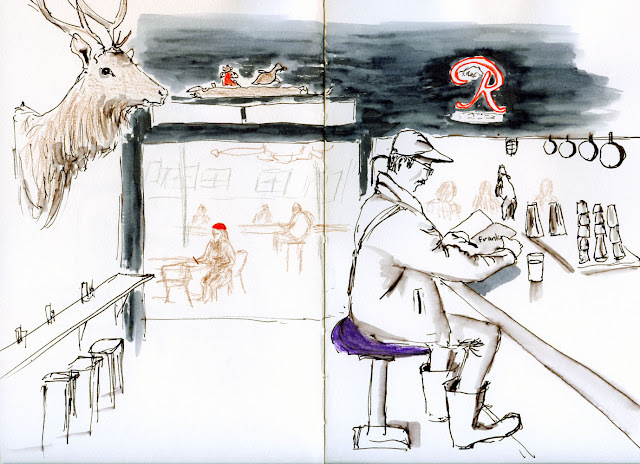 Urban Sketchers Seattle discovered this place last summer when a few of us stopped there for lunch after sketching nearby at the Ship Canal. We agreed that Drunky’s was ripe for its own sketch outing some indoor-weather day. Today was the day. I chose a stool at the end of the bar, and my eyes landed immediately on two sketchable sights: Frank Ching at the bar next to me and the elk head mounted on the wall. Behind them both was the sunlit backroom, where I regret I didn’t have time to sketch some of the many oddities in every nook and cranny. At least I got the chainsaw chandelier (one of two!) last time.